Chocolate poke cake with peanut butter pie filling, chocolate sauce and whipped cream. I somehow ended up with three jars of peanut butter in my pantry. Now, I’m a frugal shopper and don’t have a ton of space so I don’t usually pile up on reserves of stuff. Actually, I think I might be finally losing it because I also have three giant boxes of spaghetti. And three cartons of salt. And three cans of sweetened condensed milk. And what’s with three of everything? Why not two? Or four? Seeing how the universe decided I needed to have three of everything, I decided it was trying to tell me something with the peanut butter and sweetened condensed milk. I think the universe wanted a peanut butter pie. But I didn't have what I needed to make a chocolate crust and didn't feel like going to the store. What I did have was a chocolate cake mix. And then I got to thinking how thin the peanut butter pie filling is when you first mix it up and thought it’d probably be amazeballs on a poke cake. And it was! This was so easy to make and it was just so dang beautiful too! I will definitely be making this to bring to the next family function or potluck because it’s easy and beautiful and delicious! Prepare and bake chocolate cake mix per manufacturer’s instructions for a 13x9 cake. Cool cake completely. Using the handle of a standard-sized wooden spoon, poke 30-35 holes in cake (do not use a fork - the holes have to be big enough for the thick peanut butter pie filling). Combine cream cheese and sweetened condensed milk in a large bowl or stand mixer and beat with an electric mixer until smooth. Add peanut butter and continue mixing until thoroughly incorporated. Add half of the cool whip (about 3 cups) and continue mixing until mixture is well combined and smooth. You'd typically be told to "gently fold" cool whip into a recipe like this but here you're going to want to really mix it - the longer you mix it, the thinner it will become and you need it to thin out a little to spread and fill the holes. Spread peanut butter mixture evenly over cake. Cover and refrigerate at least six hours. To serve, spread remaining cool whip over peanut butter mixture. Drizzle chocolate sauce over top then sprinkle with chopped peanuts. Store in refrigerator. Your cream cheese truly be softened at room temperature. You must use something big like the handle of a wooden spoon to poke your holes - the holes have to be big enough for the thick filling. You have to mix the cool whip in with the electric mixer, not fold it in gently. It needs to thin out some. You have to let it rest at least 6 hours. 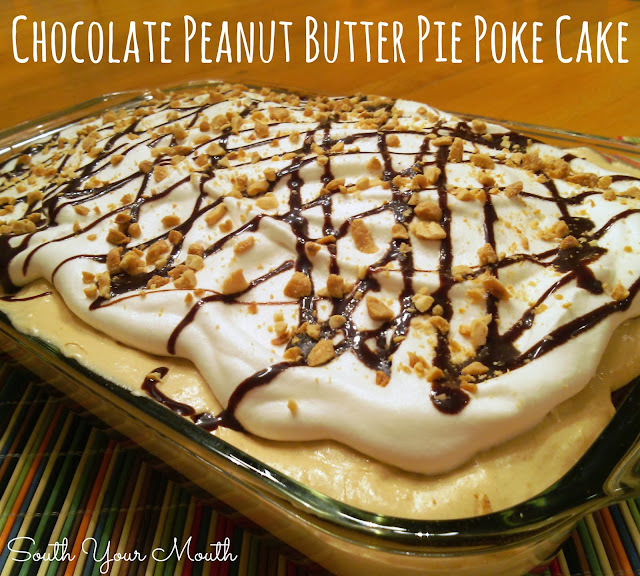 Chocolate and peanut butter is a definite combo hit! I will be trying this poke cake soon, any poke cake is generally well received by family and our friends. Ha! True on all counts! The topping and a spoon is really all I wood need! I've pretty-much eaten the last bit of it just that way... with a spoon right out of the pan! Topping, Spoon. Yeah I'm good with that! If we put it on the cake, then we have to share! Actually this look AMAZING! Can't wait to try it! Wouldn't it soak in better if the cake was still warm? A warm cake would melt the cool whip and make a good mess, I think. I'm gonna poke and pour while the cake is warm. It might help the peanut butter mixture soak into the cake more. Will frost it after it is cooled. That's a good question. ..has anyone made this? I make my peanut butter pie with chunky, so I don't see why it wouldn't work here, might need to add a little more though? No Cool Whip! Heavy whipping cream acceptable? I made this,but the peanut butter and cream cheese with condensed milk was thick. I saw no reason for punching the holes in the cake. Any thoughts? Jim, you can whip your own cream if you prefer but it won't hold as long as cool whip. If you plan on eating it all within a day or so, you'll be alright. Anony, as you can see from the photo, the mixture is thin enough to seep into the holes as it sets but I'm sure preparing it the way you did is delicious too! Am wondering also, is the consistency of the cream cheese, peanut butter ,Cool whip & milk thin enough to go through the holes? sounds delicious but wondered. As you can see from the photo, the mixture is thin enough to seep into the holes as it sets. Has any one ever tried a different flavor of cake mix like Strawberry or White,? My family is not big into chocolate so I would like to try another version. I have used a yellow cake and then poured banana pudding in holes and over cake.. Banana Poke Cake. =) It was great!! Sharon, you can just add cocoa powder to the cake mix! Hey Mandy! Just made this for an office birthday party. It came out exactly like the photo! It's delicious and everyone likes it. It is a real eye-catching dessert, too. The topping has to be thick so it won't over-moisten the cake. Thank you for posting! Made this today and it's FAB. I didn't use SCM, but 3/4 cup powdered sugar and along with the cream cheese, pb, and Cool Whip. Still came out really wonderful! I made it in two single-layer cakes and put one in the freezer to take to my son's. SO GOOD!! Thankyou! I just literally got done putting this in my fridge to "set" for tonight :) I had to make the second layer twice, since my kids ate the WHOLE bowl of the PB mixture while I had to answer the phone. I got a little taste of it and boy, was it awesome!! Can't wait to try this tonight. Thanks so much!! AH! Hahahahaha!! Sounds like my crew! I make something similar to this. I poke holes with a fork when the cake comes out of the oven. 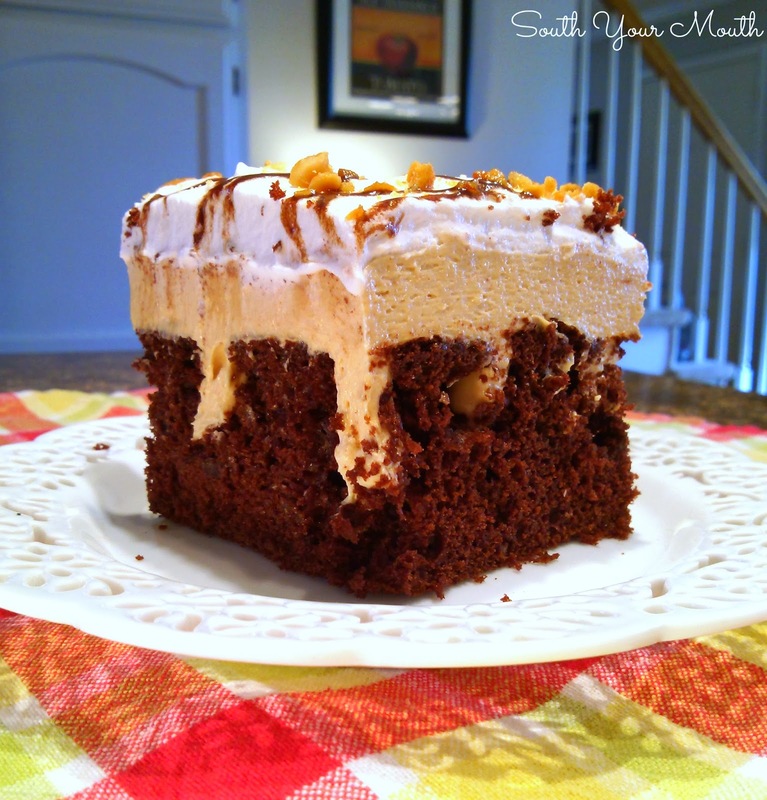 Spead 1 can of eagle brand condensed milk and smucker's caramel sauce over the cake. Take a spoon and keep spreading the mixture until the holes keep soaking it up. Let it cool and top with cool whip. Garnish with shaved chocolate or add skor chocolate bar pieces. I made this over the weekend for a birthday party - topping was too thick to seep down to the bottom of the holes, but I heard no complaints - pan was completely, and I mean completely, empty by the end of the evening. A definite hit, although next time I'll experiment to try to get the peanut butter mixture thinner so the finished product looks as good as it tastes. Mix milk,sugars, peanut butter and cornstarch together in a saucepan and cook stirring until it begins to boil. Add a little of the hot pudding to the egg yolks and stir, then add to the mixture and bring to a boil stirring constantly. Add the butter and vanilla. When the cake is baked poke holes in the top with a wooden spoon about 1 1/2 inches apart. Pour the pudding over the warm cake and spread over the top. Bump the pan, a little, so the pudding settles in the holes. Chill the cake for a few hours or overnight. Whip 1 pint of cream until stiff with 6 T. powdered sugar. Add 1 teaspoon vanilla and 2 Tablespoons of instant vanilla pudding mix. This will stabilize the cream. I always keep some vanilla instant pudding on hand for my whipped cream. It will stay stable for days when added to whipped cream. Add some grated chocolate to the top or some finely chopped chocolate chips. just put into the fridge--I admit I cheated---I used a pastry bag to push the pb mixture into the cake---worked like a dream! Then hit a dilemma as the cake was too high for the cover and I need to take it to work in the morning.....so I covered the pb layer with choc jimmies (sprinkles)......wow! thanks much for the recipe, this will be my go to for crazy great carry in desserts! This is exactly what I did! This cake is so simple and the topping is delicious! I tried this last weekend for a family gathering and it was a hit. The only thing I did different was I used a brownie mix instead of cake mix and it was delicious! What kind of Chocolate cake mix did you use in recipe? I don't think it really matters. I used a devil's food cake mix and replaced the oil w/ applesauce. It was too die for! Whatever's on sale! Any chocolate mix will do. My wildest dreams have come true. ;-}TO.DIE.FOR! Thanks so very much for sharing this amazing creation with us at Weekend Potluck. Have a great weekend. Ummm, isn't this your recipe? I have heard of them taking recipes before but this is pretty over the top. I think this is a little different than mine but, boy, do I appreciate you looking out for me! Thank you! Mandy I bake for a school every Thursday and no kind of peanuts are allowed especially in the two classes I read to. Do you think I could use marshmallow fluff instead of peanut butter or do you know of something else I could use. This sounds absolutely delicious and I will make it for my family but I need some help for my kids. Thanks Mandy. You could sure give it a try! Let us know how it turns out! Wow! I love the new format Mandy. Love the look and getting the sneak peak preview too! And this recipe looks great! Can't wait to try it out. Sadly, I don't have "reserves" on hand but that will soon change! ;) Thanks for some great reading and great recipes! Oh my stars this looks amazing! Instead of Cool Whip on top, do you think marshmallow fluff would work as a topping/frosting.....or how about marshmallow fluff mixed with some softened cream cheese? They of course drizzle with chocolate on top. OMG, can't wait to try this YUMMY cake. Love peanut butter. Thanks for sharing. why can't I copy and paste this recipe? Sounds wonderful! Can't wait to make it and take it to a crowd....can't make it just for me, or I will eat it all! P.S. Please, straighten the picture on your wall! I can't stand crooked wall hangings! Hi :) The picture is perfectly straight. Maybe the angle of the photo makes it look like it isn't. See if you've got something that's metal or plastic or maybe try greasing the spoon handle with a little butter! I made this for my coworkers, and boy did they eat it up! The peanut butter layer is the real star in this dessert. SO GOOD. I imagine it would make a mean peanut butter pie! Thanks for the recipe. Definitely a keeper! I made this last weekend and the topping was amazing! But, like others, the on wouldn't seep into the nearly 1/2 inch holes despite following the directions to the letter. Maybe a difference in brands of certain ingredients? I'll still save the recipe and make it again, I just won't bother poking holes next time! Thanks! I made this for my husband's birthday. The only thing I changed was that I topped it with chopped Reeses. It was a huge hit!